Black history is gay history, too: Out Magazine pledge to run stories throughout Black History Month about notable Black and Queer historical figures. This is great! However it doesn’t seem that the website has a collection of these articles anywhere, which would be nice. But the magazine in general is doing a good job of reporting stories on diverse populations. The Huffington Post posted a slide show of images of Black and queer “icons,” which was really cool. I learned about some people I didn’t know about before, but I might have included some others here: Bessie Smith, Lorraine Hansberry, Lena Waithe, Janelle Monae, and I was recently reminded of the story of Ruth Ellis (1899-2000), one of the oldest living lesbians in America. I’m sure there are more I’m not thinking of now (please feel free to leave names in the comments). Paul Delaney, the first Black reporter for the New York Times, didn’t want to be the only one, so he advocated for and paved the way for others to follow in his footsteps. Here are 23 Black Women Scientists who we should know about. The story of Madam C.J. Walker, the first self-made Black woman millionaire, will soon be amplified in an upcoming Netflix series starring Octavia Butler. I am eagerly awaiting that! This article from the New Yorker in 2017 about Pauli Murray (1910-1985) makes you wonder why her life and legacy are not more widely known. As the article states, “Murray’s lifelong fate [was] to be both ahead of her time and behind the scenes.” She may not be a household name, but she has been sainted by the Episcopal church, and there is a residential college named after her at Harvard. “There is no such thing as a Nonracist,” an interview with Ibram Kendi. “It’s very difficult to grow up in a country or even a world that’s constantly raining racist ideas on your head and to never get wet.” Even well-meaning and nice people who recognize that racism is bad are viewing the world through a racist lens. The only way we can build a more just and equitable world is if every person takes responsibility for their internalized racism, recognizes it and consciously, mindfully, intentionally works to change it within themselves. Today we honor the life of Dr. Martin Luther King, Jr. and his legacy. I’m not sure how to do that now in this divided nation that doesn’t seem to have any clear or agreed-upon understanding of its own history. I have been listening and learning for all my life about the Civil Rights movement of the 1960s, the legacy of slavery, the Civil War, white supremacy, and racism. I am learning more details of American history, and trying to comprehend how our path to this moment influences how we think and act, and make decisions, as individuals and as a nation. Whether I’m examining my country or myself, it isn’t pretty. In the last several years I have observed some simultaneous enlightenment and denial, facts in conflict with fantastic fiction of which the toxic seeds were planted so long ago that it has taken root like a tenacious, noxious weed that hasn’t left room for anything else to grow. But in the movement towards enlightenment I am seeing seed of hope are being sown. In my own small way of amplification of some of this truth-telling, I will share here things that I have been absorbing in the last couple of years that are giving me hope. These are things that are helping me to understand America, my identity and responsibility as a white person in working towards the anti-racist society that is the world I wish to live in. Uncivil tells stories of the Civil War that are often left out of its official telling. These are stories of the agency of black people, the exposure of the lies of the Southern “Lost Cause”, and a deep look at how racism is embedded in our culture. There is hope here, at least for me, in that exposing these truths of American history perhaps we can understand and unravel the paradigm of white supremacy. Seeing White from Scene on Radio is another American history podcast that dives deeply into white identity in a way that we are not used to doing. This podcast challenges the position of privilege that white people occupy, a paradigm so dominant that white people haven’t had to think about what it means to be white. It’s a fascinating look at how the social construct of race came into being and how it was used to justify white supremacy. Another podcast, Reveal (fantastic investigative journalism), had an episode in December of 2018, Monumental Lies. This story exposes the making of the distorted history that many Southerners cling to that frames Confederate generals as heroes and claims that slaves in the South were happy and treated well. It is galling to hear how children in the south are still being taught these lies, and Confederate monuments have been and still are preserved with taxpayer money. The story traces the history of how the seeds of these lies were planted and leaves the listener hopeful that the revealed truth will unravel these false teachings. So, I’m here again to dust off this old blog. It has been quite a while since I have mustered the discipline to write regularly, just not making it a priority for a couple of years. After some encouragement from loved ones near and far, I’ve decided to pick it up again. Not that I expect wide readership, but I think that if nothing else I will appreciate the time capsule of part of my life recorded here, where I will mostly likely talk about what I’m reading, listening to, watching, observing, thinking, feeling. Today I began the discipline by updating my Inspiring Lives page, looking at obituaries from 2016 to now. Wow. 2016 was really a terrible year for loss of public figures who meant a lot to me and my generation. I remember well going through that time, on social media people were declaring 2016 the worst year ever, as more and more of our role models and icons died. Not to mention the presidential election inexplicably going to Donald Trump, which was the real tragedy that year. At the time I was super sad, but I also thought to myself “this isn’t the worst year…..that is yet to come.” Indeed, the years that followed have been pretty terrible. But at the same time, for me personally, I have much to be thankful for, and I remember every day all that I am grateful for. Mary Oliver died last week. My social media feed was overwhelmed with grief at her passing. It’s odd how comforting it is to share in the collective grief online, reading the quotes from her poetry that people chose to share in their remembering what she and her work have meant to them. Honestly, though I majored in literature and I have a real love for beautiful writing, poetry is not something that I have read regularly in my adult life since college. I have certainly read many Mary Oliver poems that friends and family have shared with me over the years, but I can’t claim the attachment to her that many others I know do. I am certainly saddened by her death, and inspired by her life, and like, I suspect, many others, my appreciation of her work will grow, especially now that she has passed. A notable death is a moment in time to appreciate and learn from a life well-lived. One of the many reasons I love a good obit. Since Oliver’s passing on January 17, there have been many excellent articles about her life and the impact of her work. They are all worth reading. And then afterwords, get to reading her original words! From the wonderful BrainPickings website, they republished a post from 2015 about Oliver’s life with the photographer Molly Malone Cook. Another from BrainPickings: Mary Oliver on commitment to a creative life from 2016. “Mary Oliver on Grief and Loss“, from the New York Times. “Mary Oliver’s Deep, Direct Love for the World”, from the New Yorker. “Listening to the World”, an interview with Krista Tippet for On Being. I taught a yoga class this week, and was inspired to conclude it with a Mary Oliver poem that I found. I thought it was fitting as it was about how the spirit occupies the body, something that I think about a lot in my yoga practice. I’ve never been one to fly a rainbow flag. For all of the years that I have been out and proud, my feelings about the rainbow have remained ambivalent. Perhaps it is because I have lived in places where rainbow flags were everywhere and I may have taken it for granted. But it may also be that I have never felt a strong identification with the rainbow flag, as I often associate it with the gay male community, which is not always welcoming to women. Now I am in a part of the country which has plenty of gay-friendly folks, but they are are fewer and father between, especially out in the suburbs where I live. And for all those who do support gay rights, many more neighbors are neutral on the issue at best, and there are some who are less than friendly towards the LGBT community, even if they won’t say so out loud. For all of the neighbors who, like us, have yard signs saying “Hate Has No Home Here,” there are at least as many who have signs saying “We Support Police,” which are often surrounded by American flags, as a specific display of and claim to patriotism. These yard displays translate to me and my African-American spouse as “your lives do not matter.” It may seem like an unfair assumption for me to make, but I do so out of experience and self preservation. I am wary of those neighbors. 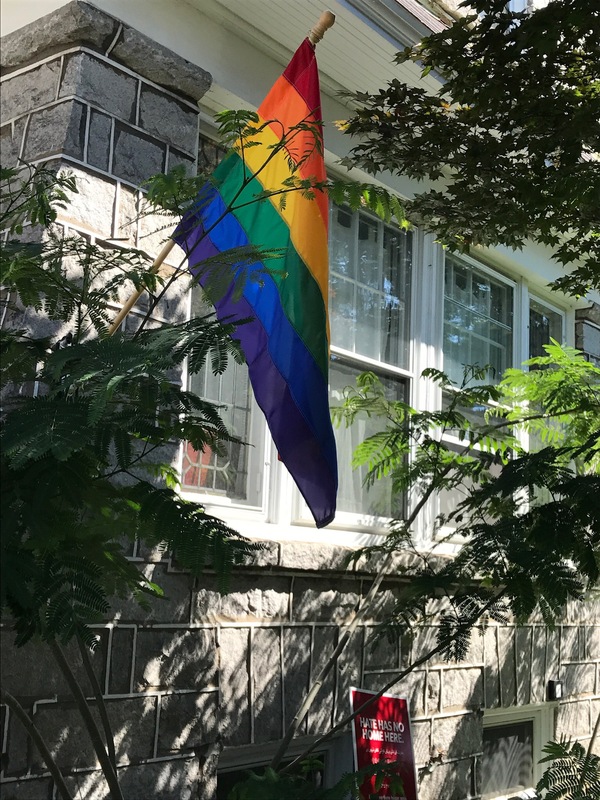 Living in a place where being out and visible actually makes a difference, and in the current political climate, it feels important to my spouse and I to hang a flag. I got over my ambivalence, deciding that I wasn’t going to let gay men have sole claim to the rainbow flag. It’s ours, too. We want to let our neighbors know we’re queer, and we are part of this community. At the beginning of July, my spouse and I agreed that we would switch up and hang an American flag in honor of Independence Day. 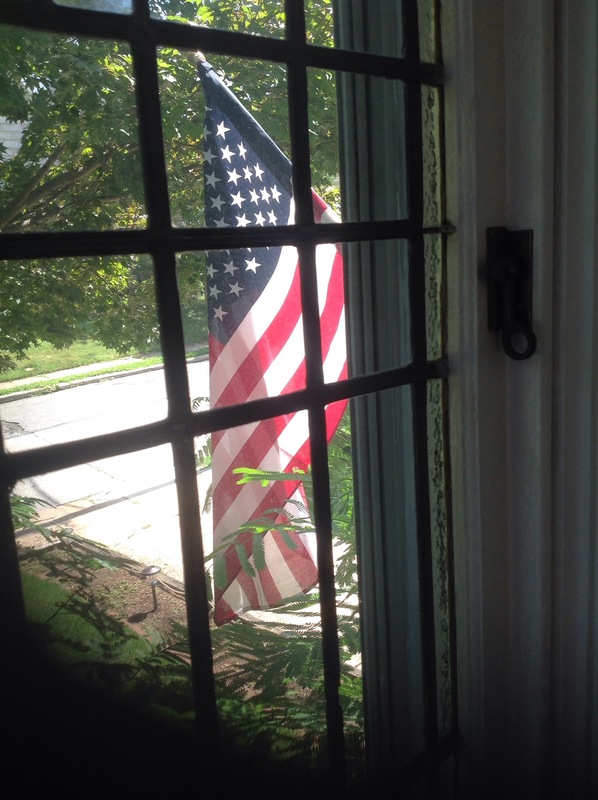 Like flying the rainbow flag, I have often felt ambivalent about patriotism. As a woman, as a lesbian, and as someone with decidedly liberal political views, I have often felt that my own country does not value me as a citizen. There have been times in my life where I disagreed so vehemently with the direction of the American government and policy that I actually felt ashamed of my country. There is a lot about what is happening in this country now that makes me feel shame, not the least of which is the breakdown of civil discourse. But the source of this shame does not define my American identity, nor is it what I believe this country is at its heart. In the same spirit as we flew our rainbow flag, we are flying our American flag. We are out and proud Americans. I love my country, and I refuse to let my racist and homophobic neighbors lay sole claim to the American flag and dictate what it means to be patriotic. I’ve been listening to tracks from this album since they started releasing them late last year. The entire album was released in January, and it has really been my soundtrack for 2016. Perhaps this music has helped me get through the huge cultural losses of 2016 (Tedeschi Trucks has a connection to David Bowie through their bassist, Tim Lefebvre), and they played Bowie’s Oh You Pretty Things). I love this album. One of my favorite tracks is the song Just as Strange, which, in concert, Derek Trucks will open with a riff from the George Harrison song Within you and Without you, and it’s just beautiful. This album has so much going on. It’s fascinating to listen to. It has one nautical theme that threads throughout, and it’s a father’s attempt to welcome his first child to the world and pass on some wisdom. Thank goodness he chose to share it with the rest of us. I love that Sturgill Simpson insists on being his own person, defined by no music genre, though solidly based in country music. His cover of Nirvana’s In Bloom has the twang of a pedal steel guitar to establish that this is his interpretation of the grunge rock classic. It’s one of those covers that sounds so different, yet recognizable because it’s so familiar. He makes it his own while paying homage and respect to the original. This album is a positive and empowering message, with lyrics that acknowledge personal struggle, ultimately delivering a prescription of self love and self care. There is strength and gentleness with layers of harmony that on tracks like Cranes in the Sky are almost cacophonous, but stay together in beautiful melody. There are interludes between some of the tracks, with voices talking about black pride, and each one is artfully woven into the songs on either side. Other albums have attempted this, with the effect of feeling like an interruption. Here the interludes flow and feel seemless from track to track. The artful weaving of the positive messages of the lyrics, the stories of the interludes, and the beautiful harmonies is what makes the album cohesive and a pleasure to hear from beginning to end. As a long-time fan of both kd lang and Nico Case, I was anxiously awaiting the release of this album, and it didn’t disappoint. I’m not familiar with Laura Veirs music, but I’m very glad she joined the others for this unlikely collaboration. I was delightfully surprised when I heard about them coming together for this. I love each of their voices, but they are so different, both in voice quality and the style of music. Each singer has a chance to shine, taking turns singing lead while the other two back them up. I never would have put them together, but it really works. This album is classic country music, and it has deservedly received a lot of critical acclaim. With songs about being hard up, hard drinking, and doing hard time, all sung with the strength of a survivor, these songs are a collection of stories that will make you laugh or say “hell, yes!” Many are comparing her to Loretta Lynn, and that influence is certainly present. But while steeped in the country tradition, Price has her own style. This being her debut album, I look forward to her future projects. Sia is arguably the greatest current pop singer/song writer. While there are a few pop artists that I enjoy listening to, few would ever make my top ten albums list. Sia is the exception to that rule. I have been a fan since the first time I heard her with the closing song of the Six Feet Under series finale. Since then she has had numerous pop hits of her own, as well as penning songs for other artists. For a pop singer, Sia is deep and emotional, simultaneously able to capture life’s hardships and celebrations, sometimes in the same song. This is Acting has so may good songs! And it seems to me it is such an appropriate album for 2016, with lyrics that address loss, challenges, and resistance to negativity. In the song Reaper, she defiantly addresses death, saying “Don’t come for me today, I’m feeling good, let me savour it.” 2016 was a hard year, yet we persevere knowing we have more to do in this life. This album may have a special place in my heart because I spent my young adulthood in Oakland, CA.. He successfully captures so much of Oakland’s spirit, and the reality of what makes it simultaneously a wonderful and challenging place to live. The music is gritty and funky, and he artfully weaves into the music the voices of its denizens. I love his story, too. In 2015, he was the winner of NPR’s Tiny Desk Concert competition, and though he’s been making music for some time this is what put him on the map. After years of personal struggle, this album is his rising from the ashes. I hope to hear more from him. At 27, this woman sings like an old soul. Her voice and songwriting reflect wisdom beyond her years. The album opens with Rookie Dreaming, and her voice soars with richness and strength with emotional expression. A review on NPR posits that “Somehow, between being born in Arizona in 1990 and moving to Washington in 2011, singer, songwriter and guitarist Courtney Marie Andrews seems to have spent time in early-’70s Laurel Canyon.” While I don’t like to compare musicians to each other, I can’t help but hear Joni Mitchell there. The music is more straight-forward folk/country, and the lyrics are intelligent, conveying feeling and story. Sometimes music has to grow on me, I need to hear it a few times before I can say that I like it. The first time I heard this album I knew it would be one of my favorites of 2016. Of the many things I have been reading and hearing recently, the topics of race and class stand out. I was pleased to find many very good pieces that I have been mulling over and sharing with others. The Stuff You Missed In History Class podcast dedicated two fascinating episodes on the history of redlining in the United States. The show astutely illustrates how early twentieth century policies on real estate and housing were overtly and unapologetically discriminatory against blacks. The two episodes show how these policies and now illegal practices have consequences that are still with us today. The excellent podcast Decode DC did an episode about the late Senator Daniel Patrick Moinihan’s study in 1965 on poverty in the United States, which has, for better or worse, created a commonly held belief that poverty is caused by dysfunctional family and culture, and as a result the conversation essentially ignores the legacy of slavery. Today I listened to the Philadelphia Free Library Author Events Podcast featuring an interview with Ta-Nehisi Coates about his life and his new book, Between the World and Me. Coates provides a tangible illustration of the damage done by the history of racist and classist policies in American institutions. For hundreds of years, for multiple generations, an entire class of people has been exploited, and effectively blocked from social and economic advancement. I appreciate the widening interest and scholarship on this aspect of American life. I am hopeful that the information and insight coming to light will continue to advance the conversation on race, and help us all have a clearer understanding of our relationship and responsibility to work to change institutionalized racism and unjust policies. I am a music geek. I used to write a music review column for my college newspaper, and I have always listened to popular music with a discerning ear. I don’t claim to be a purist or an expert. I like what I like, and some times LOVE, and I’m driven to obsession at times to listen unceasingly to a new favorite album, or an old one, and to find out every little thing about its production and composition. But I haven’t acted like it in the last decade or so. I’ve been more of a dabbler, just turning on the radio and occasionally tuning in to my favorite music critics. Spotify has inspired me to listen critically and intentionally again. My New Year’s resolution last year was to listen to music more intentionally again, and I have done that. It has been very enjoyable. As a result, I have created numerous playlists, and I have become more aware of new music. So, I am making annual lists on Spotify, composed of the albums I am checking out, and the songs that I like best. I’m rather proud of my lists for 2014 and 2015. I’m particularly proud of my list for the current decade. There is a lot of good music out there! The Firewatcher’s Daughter – Brandi Carlisle What can I say? I love Brandi’s voice. And she’s a beautiful lyricist. How Big, How Blue, How Beautiful – Florence and the Machine I love the drama and passion of Flo. I would make an exception to my no-stadium-shows rule if I could see her live. Not sure if I can make an exception to the exorbitantly priced tickets, but you get my meaning. The Weather Below – Sister Sparrow and the Dirty Birds This is just good music. Bluesy rock. Freedom & Surrender – LIzz Wright I was so excited about this album’s release that I was counting down the days. She hasn’t had a new album in years, and I’m so glad that she found another label to record with. Listening to Lizz Wright makes me feel like I’ve gone to church. Stuff Like That There – Yo La Tengo Georgia Hubley’s voice reminds me of Nico on her tracks with the Velvet Underground. I enjoy the unusual covers and their new songs. Ones and Sixes – Low This band is a new discovery for me. How did I not know about them for the last 20-odd years? They are amazing, and now I’m obsessed with catching up with their previous 14 albums. Beautiful, slow, mellow, a little brooding, sometimes rocking. There are more albums I’m considering for my top ten or top twenty. There are still three months left of the year, so I look forward to having more to say in January!